Portland-based artist Wendy Red Star (Apsa’alooke, b. 1981), studied sculpture at Montana State University and earned her MFA in sculpture from UCLA. 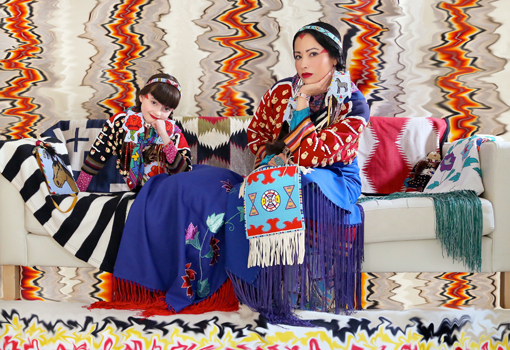 Raised on the Apsaalooke (Crow) reservation in south-central Montana, her multimedia works explore the intersections of traditional Native American culture and contemporary society. Red Star is an intense researcher of archives and historical narratives and she seeks to incorporate and recast her research in work that is by turns inquisitive, witty and unsettling. As a contemporary visual artist, Red Star’s work is informed both by her cultural heritage and her engagement with many forms of creative expression. She works across disciplines including photography, beadwork, fiber arts and performance to offer unexpected and new perspectives on Native life, both historical and as it is lived today. She also places a high value on intergenerational collaborative work, and providing a forum for Native women’s voices to be expressed in contemporary art forms. Red Star is currently showing work in “Contemporary Native Photographers and the Edward Curtis Legacy” at the Portland Art Museum, and has recently had a solo show at APEX (PAM), a socially critical installation using historic photographs for Chief Medicine Crow (c. 1848-1920) alongside tapestries, writing and other objects to restore humanity to a leader whose image has been appropriated for commercial use. Red Star maintains an active Instagram account of images and video documenting her artistic practice and on-going creative engagement with Native communities and events.